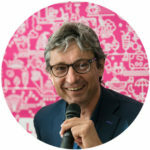 For the second time Mayor of Rimini, Andrea Gnassi progressively characterizes his administrative experience through a strong push to the new perspectives of tourism and to the synergy with culture. Graduated in Political Science at the University of Bologna, he has collected experiences in unusual communication fields for an Italian politician. He gives constant impulse to the dialectic between hardware (intended as investments in public works), and software (tourism promotion and the ‘immaterial production’ of events that combine innovation and tradition), to generate a creative ‘mood’ that values ideas, freedom, well-being, modernity in favor of the city.